The roundtable begins with the panellists introducing their respective collectives/communities. It is important to note that this discussion does not include all the photo communities in Indonesia. Those missing include Matanesia from Surabaya and MES 56 from Yogyakarta. Those present in the panel represent communities from five different cities across Java. In the roundtable, Bandung is represented by two photo communities: Bungkus! and Kami Punya Cerita (KPC). Bungkus! is initiated by seven friends with the idea of publishing a photo zine. From the onset, the key motivation for Bungkus! is to map the photographic practices of Bandung. The magazine has a rather unique approach in choosing work for publication. First of all, editors of the magazine invite submissions from the public based on the chosen theme. Those who make submissions have to defend their work on presentation night. The editors will then choose the best project, in accordance to the theme. KPC is founded and managed by Arum. Relocating to Bandung some years back, Arum tried to find a place to discuss photography. Instead of seeking an existing photo community, she built a new one by opening a space for members of the public who have an interest in photography or in using the medium to create stories in a fun and relaxed manner. Storytelling, not photography, is the main focus of KPC’s free workshops. It has “graduated” ten batches of participants. “Srawung” is a Javanese word, which means “jalan bersama” (walk together). 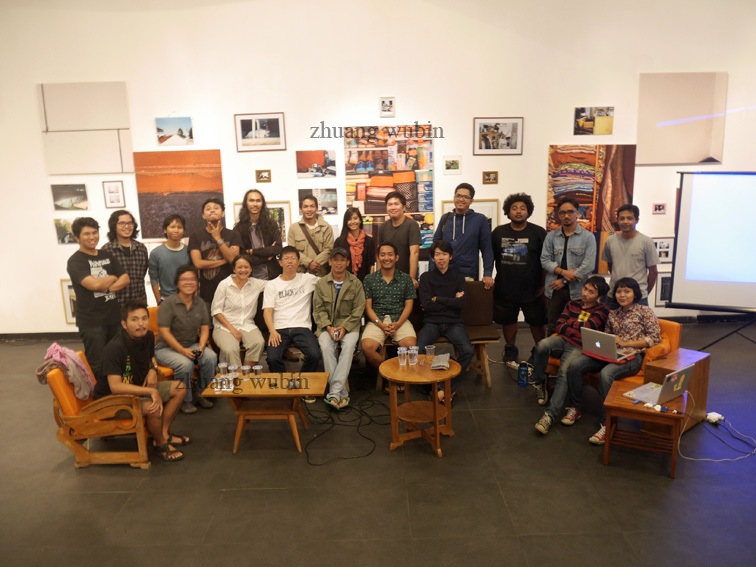 In 2012, five people founded Srawung Photo Forum because they were envious of other cities with existing photo communities. Before Srawung, photo practitioners in Solo largely kept to their own circles. Broadly speaking, followers of photojournalism and salon photography made up the two camps of photo practitioners there. Srawung aims to be a place for discussion and discourse in photography. They strive to cover everything from street photography to photojournalism. While the initial aim was to establish a space for discussion, Srawung has expanded into exhibition-making and photobook publishing. Walking in Ngalam also started as a small community of five founders on August 2012. It became more active in 2013. With Malang evolving rapidly, the aim of the community is to encourage the public to document these changes, instead of using photography merely to take selfies. To do so, they host discussions and workshops to highlight the potential of photography as a documenting tool. Programmes also include exhibitions, photobook sharing and collaborations with photo communities in school. Kelas Pagi Yogyakarta (KPY) started in 2009 as a loosely affiliated branch of Kelas Pagi Jakarta, which was founded in 2006 by photographer Anton Ismael. Initially, KPY aimed to offer free classes to members of the public who displayed an interest in photography. Since 2014, KPY has reorganised into two divisions: education and programming. Budi was previously part of the collective, Chepas Photo Forum, which was founded in 2010 because the founders felt that most discussions then centred on the technical aspects of photography. Compared to the aforementioned communities, Panna Photo Institute is more institutionalised. Its founders hail from a professional photojournalistic background. In 2006, they initiated Panna to focus on photographic education. Panna administers grants to journalists, offers training to trainers, organises photo exhibitions and publishes photo books. It runs classes on visual literacy and the crafting of personal projects. It also has a library. The classes are being expanded to cities outside Jakarta. In short, the communities represented at this roundtable are created for different reasons. One common thread is that they aim to create a space for discussion while educating their audience to photography. The cities where these photo communities are located present different challenges, especially in relation to sustaining and growing the collectives. For example, Malang and Solo are relatively small cities compared to Bandung, Jakarta and Yogyakarta. As the capital city, Jakarta experiences a different magnitude of problems, which makes it a hotspot for news and the logical base for working photojournalists. Malang and Solo are less intense cities but their residents encounter issues of their own. These differences affect the evolution of each collective. The differing structures of these communities also affect their development. For instance, Srawung is loosely regulated, as the founders come and go as they wish. Nowadays, it is relatively dormant because its founders have become preoccupied by diverging interests. Walking in Ngalam faces the same issue. In contrast, Panna is the only community at the roundtable, which is founded from the onset as a foundation. The legal status has made it easier for Panna to work with sponsors and reputable organisations in Indonesia and beyond. It is fair to say that most photo communities in Indonesia are founded in a more fluid and informal manner. As the moderator, Wubin notes that most founders of these photo communities are practitioners of photography. To organise communities requires institution-building skills, which they may or may not have. This is the challenge that they face as organisers of collectives. Some of them like Ng Swan Ti already had experience in managing organisations before founding Panna while Aji Susanto started without any experience. Budi Dharmawan notes that he learnt about organising communities through his involvement with other collectives while Tandia still finds it difficult to manage a collective—let alone build a community like Bungkus!, which is relatively different in structure, compared to others. Kurniadi Widodo, a member of KPY present in the audience, raises the issue of sustainability amongst these photo communities. He notes that he always sees the same faces who attend events and activities organised by KPY. Can a collective survive for a sustained period with no newcomers? The panellists have differing views regarding this question but in general, they agree that even if there is no regeneration within a collective, there will be other communities that will continue to sprout, extending the existing collectives in other ways. Budi believes that it is better to develop the vision of each collective instead of worrying about the issue of sustainability. In effect, each community has to develop its own system of regeneration. Wubin observes that, compared to ten years ago, there are more photo communities now in Indonesia, a trend that suggests that the audience for photography has expanded. It is clear that individuals from the audience will move up the ladder to take on organisational roles in existing communities or to establish new ones. In the case of KPC, even though members of its alumni have increased, the community is still managed by Arum. Students from previous batches advertise its programme through word-of-mouth. In this way, Arum does not see regeneration as an issue. The general consensus is that art audiences’ interest towards photo collectives is minimal or negligible. It is true that some tertiary art students have participated in KPC and that many of the shows in BPS are hosted by art galleries. At the same time, there are also art students present at BPS who wonder why photography is being exhibited in art venues. Even in Yogyakarta, the audiences of MES 56 and KPY rarely overlap, even though members from both communities sometimes hang out together. Budi suggests that it is probably because KPY is heavily oriented towards education and the work produced by its participants are mostly at “student” level, which does not warrant the interest of art communities.